General Motors unveiled the 2020 Chevrolet Silverado HD, the latest generation of its heavy-duty pickup truck, on Tuesday at its assembly plant in Flint, Mich. The truck will make its public debut at the 2019 Chicago Auto Show this week. The 2020 Silverado HD arrives as chief competitors Ford and Ram also revealed new heavy-duty trucks. The Ford Super Duty has updated engines and a 10-speed transmission. The Ram HD has a luxurious interior and delivers up to 1,000 pound-feet of torque. GM stressed a number of minor changes in the 2020 Silverado HD that add up to a greatly improved product. There is a new, direct-injected 6.6-liter gasoline V8 engine with 401 horsepower and 464 pound-feet of torque mated to a six-speed automatic transmission. The 6.6-liter turbodiesel Duramax V8 engine returns with 445 horsepower and 910 pound-feet of torque. It’s mated to a new 10-speed automatic transmission developed in tandem with Allison Transmission. Unlike the Silverado HD's other four trims, the High Country features the Chevy bow tie on its grille. The cockpit of the Silverado HD's High Country trim features premium trims and what Chevrolet says is the best front seat legroom and headroom. The truck’s frame is built with high-strength steel to make it stiffer and stronger. GM upgraded the suspension to handle greater towing demands and provide a smooth ride. The frame is coated with corrosion protection for a longer life. The truck features larger footholds in the rear bumper and integrated side steps for easy access into the bed. Four-wheel-drive models come with a two-speed transfer case. Available equipment includes a power-up-and-down tailgate and factory-installed power takeoff to charge devices on a work site. “We had one goal for this program: to make the best heavy-duty trucks on the market, bar none,” said Jaclyn McQuaid, GM’s chief engineer of next-generation heavy-duty pickups. The 2020 Silverado HD can now lay claim to best-in-class maximum trailering capacity of 35,500 pounds. The number is possible with a dual-rear-wheel Silverado 3500 powered by the 6.6-liter Duramax engine using a fifth-wheel or gooseneck setup. The rating is 400 pounds higher than the 2019 Ram HD. Just as important is that every diesel-powered Silverado dually can tow more than 30,000 pounds regardless of trim level, McQuaid said. Though it does not match the 1,000 pound-feet of torque in the Ram, the Silverado HD makes better use of its power, she said. The full 910 pound-feet of torque in the Duramax engine is available in first gear. The single-rear-wheel 3500HD can tow up to 21,500 pounds and the 2500HD tows up to 18,600 pounds. The new gas engine has a maximum trailering capacity of 17,400 pounds with a fifth wheel or gooseneck. It is an 18 percent improvement over the previous heavy-duty gasoline engine. The 10-speed transmission is an all-new feature. GM and Allison engineers collaborated on its development, designing and testing the unit together. The final product will be built by GM and carry the Allison badge. “Everything is validated to Allison’s legendary requirements,” McQuaid said. The 2020 Chevrolet Silverado HD will go on sale this summer and will be available in five trim levels: Work Truck, LT, Custom, LTZ and High Country. All trims except the premium High Country feature a bold front fascia with a glaring “Chevrolet” stamped across the front. The automaker wanted to make a statement with the style, said Rich Scheer, exterior design manager for GM. Work Truck is an entry-level trim with a spartan interior. Custom is new to the Silverado HD and brings body-colored trim and standard 20-inch wheels to the table. The LT trim adds a chrome grille, and the LTZ offers more chrome, LED lighting and more wheel options. High Country is the most upscale in the lineup with a unique look, classic bowtie badge and premium interior. All trims are available as a dually. Chevrolet increased space in the interior of the truck, claiming best-in-class headroom and legroom in the front seats. Center console storage is large, and models with a front bench seat can move the center space into multiple configurations as needed. There is at least one USB port and one USB-C in each trim. The infotainment screen and button layout will be familiar to owners of previous GM trucks. Buttons are easy to locate. However, the Silverado HD lags in comparison with the dazzling style in some Ram HD trim levels. Scheer said Chevrolet decided to use durable interior materials to withstand the demanding usage of heavy-duty customers. Up to eight exterior cameras on the Silverado afford 15 possible views. The bed view camera sits atop the center high-mounted brake light. Bowl view provides a rear-facing 3D surround view that offers a sense of height of objects surrounding the truck. Picture in picture side view shows the rear side view with the view from the rear trailer camera accessory. Hitch view zooms in on the hitch for precise alignment when connecting a trailer using a conventional hitch. Transparent trailer view combines the tailgate-mounted camera with an optional camera accessory mounted on the rear of the trailer, giving the driver a virtual view through the trailer. Rear camera view provides a look directly behind the truck. Rear side view shows both rear sides of the vehicle in a split when a trailer is being towed. The 2020 Silverado HD also is loaded with trailering technology. It’s available with up to eight exterior cameras with 15 possible views to activate on the center screen. Among them are a rear-side view to highlight blind spots while towing and a “transparent trailer view” that displays the road virtually as if the trailer were not there. 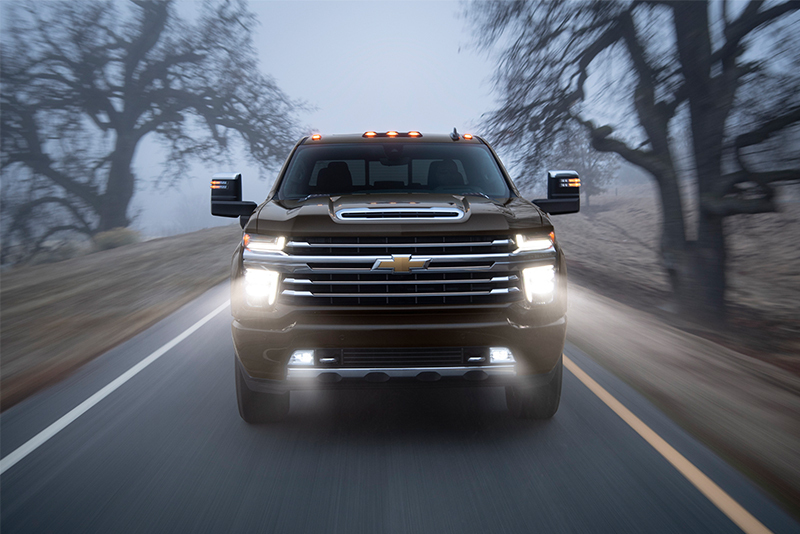 The heavy-duty truck also has the Advanced Trailering System that’s available on the Silverado 1500. It includes notifications for trailer maintenance, tire pressure and electrical diagnostics. It can provide a predeparture checklist or test the trailer’s lights. The 2020 Silverado HD will be assembled at GM’s Flint factory, which exclusively builds full-size, heavy-duty trucks. The 2020 GMC Sierra HD also will be made there. GM has invested more than $1.5 billion in the facility since 2011 to increase its size from 3.7 million square feet to nearly 6 million. The plant builds 250,000 trucks per year, or one every 90 seconds.